We honor our Veterans and active military. Since only the US Post Office is closed and other carriers — UPS, FedEx and DHL — are open, Pak Mail is open for business as usual on Monday, November 12. If you’re feeling bullied by Amazon, you’re not alone. Returns to this online giant should be easy. The Amazon Returns QR Code excludes UPS Authorized Shipping Outlets like Pak Mail. It forces us to send our customers on an inconvenient journey to The UPS Store. There is a way around this craziness. 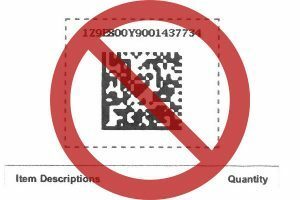 Log into your Amazon account and cancel the return using the QR Code. Go back and request the return with a UPS label. Either print the label and tape it to your box for drop off at Pak Mail, or email the label to Pak Mail and we will adhere it to the box for you. Choose a printed UPS label not a QR code. Monday, October 8, the US Post Office is closed for Columbus Day. All other carriers are open — UPS, FedEx, DHL. Pak Mail is open! 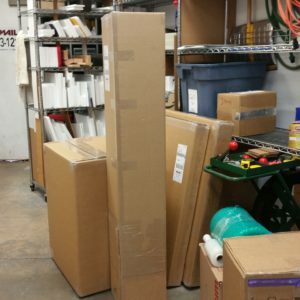 What do you need to ship this week? 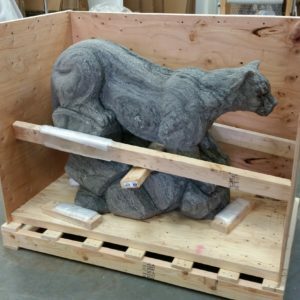 We built a sturdy wooden crate for this 400-pound Colorado Marble cougar sculpture from John Kessler. Total shipping weight of 500 pounds meant it shipped to Florida with a freight carrier. 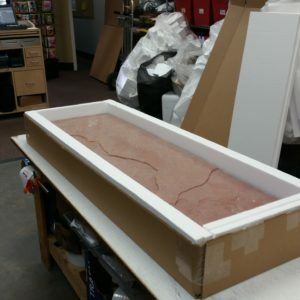 Stone table tops require special packaging for safe shipping. 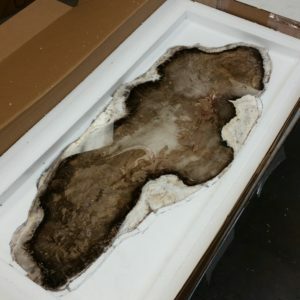 Smaller pieces like the petrified wood slab can ship as a UPS or FedEx small package. The slab is protected and kept absolutely flat in a rigid Styro-lined box, which is then floated in a second box filled with peanuts. Small packages shipped with UPS or FedEx must withstand the rigors of handling by carrier drivers, various package orientations, and facility conveyor belts. Larger, heavier pieces like the sandstone table top ship on a pallet with a freight carrier. The packaging also keeps the stone flat in a rigid Styro-lined box; a second box is not required. 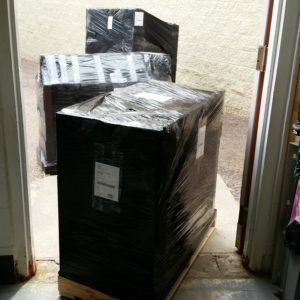 The finished package is placed on its edge and strapped to a pallet. A little extra care ensures safe delivery. 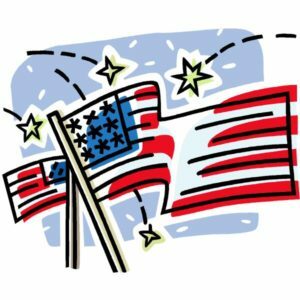 Please be safe and have fun celebrating our freedoms! 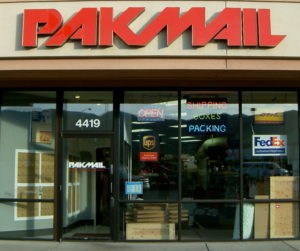 Discover Goodwill of Southern and Western Colorado online auction lists Pak Mail as the shipper of choice for larger items. 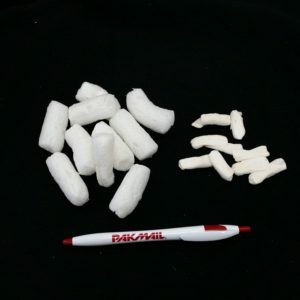 We provide pickup-pack-and-ship estimates daily for a variety of items. 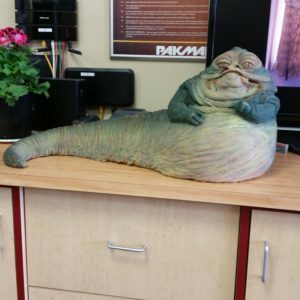 Pak Mail recently shipped framed artwork and prints, bicycles, a remote-controlled gas helicopter, and Jabba the Hut. We recommend getting a pack-and-ship estimate before bidding on Goodwill items to eliminate any shipping surprises. It helps determine the auction bidding budget. Pictures tell the story. Even though the packages in the first photo look “large,” they are actually small packages shipping FedEx Ground. They include a rug and some paintings from the Discover Goodwill online auction. The second and third represent freight shipping — from prepping to pickup by the carrier. The crate (barely visible near the door) in the third photo contains a bronze bird. The boxes on the floor are from an estate and the boxes on the pack table are a sentimental cradle. The three pallet shipments in the second photo are the cradle, the estate items, and a van conversion kit from Wayfarer Vans. A Pak Mail customer recently traveled to the Colorado Springs-Denver area to shop at our local household furnishings consignment shops. She came away with two tables, some paintings, and the glass chandelier pictured here. 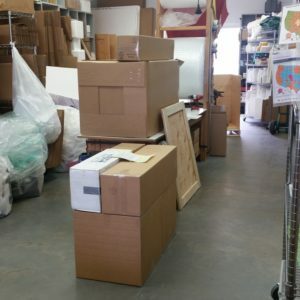 After packing the items and securing them to a custom pallet, the shipment left our store. It was delivered safely. 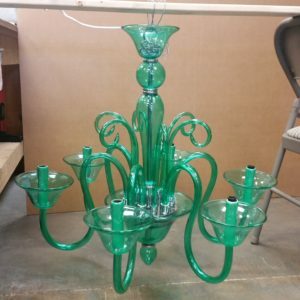 What is the best way to pack a solid glass chandelier? 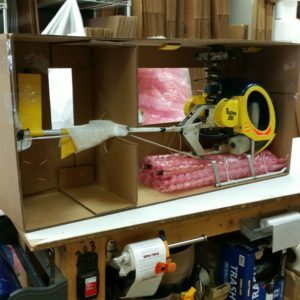 Suspended in a sturdy box or crate filled with packing peanuts, and strapped to a pallet for freight shipping. This method keeps all pressure off the delicate arms of the chandelier.